Steve Ditko back in the Silver Age of comic-books. 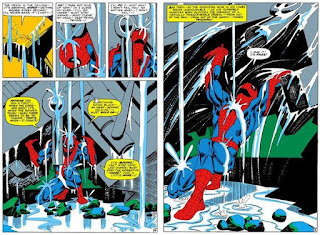 Steve Ditko died yesterday, July 6th, 2018 at the age of 90. He is of course known for a lot of amazing comic-book work such as co-creating Spider-Man with Stan Lee, so that of course carries all the debate of who deserves more credit as fans always argue about. 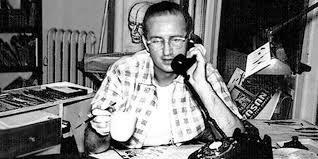 Plenty of people who know a lot more about Ditko and the amazing generation of comic-creators who seem to sadly be leaving us due to age and/or ailment have written about him in-depth so I'll just share some personal thoughts and opinions. From what I know about Ditko he was a strong personality with deeply-beliefs and shunned the limelight in a way completely counter to his former collaborator Stan Lee. Ditko was Objectivist who viewed things as good-and-wrong, black-and-white, and created comics once he left Marvel which reflected these views. He refused to give interviews, saying his work stated everything that needed to be said, but wasn't a recluse by any means, still apparently living everyday life out-and-about in public and even responding to a young fan who wrote him a letter, which astounded everyone who thought him to be some kind of curmudgeon for one reason or another. As for why he might've been thought of somewhat negatively...well, Stan Lee is the one who always likes to be in front of the camera, and Lee doesn't argue when folk want to give him credit for the success of a character like Spider-Man. It's a testy issue, and one of the few times I've ever seen Stan Lee break his character of, "Stan Lee, expert showman," is when he was interviewed by British talk-show host and comic-fan Jonathan Ross for the movie, "In Search of Steve Ditko." In that flick during an interview with Stan Lee it is apparent Lee truly feels he deserves the majority of the credit for Spider-Man's success, regardless of what Ditko contributed. Lee says he tried to appease Ditko by making it clear to everyone they were co-creators, but Lee clearly struggles to believe that himself. With Stan Lee always in the news it just became easy for folk to ignore or outright forget about Ditko as he kept mostly to himself, putting out the occasional self-published comic and just living life. I by no means agree with Ditko's political beliefs (my being pretty Liberal is basically a polar opposite of Ditko), but I always admired his talent and skill. Plus, there is something impressive about a person believing in something so much they passed on the countless opportunities they could have had for further fame and fortune to just do whatever else they wanted. Ditko could have gotten so much further fame for simply creating Spider-Man if he had done nothing else--and he did plenty more, co-creating Doctor Strange for instance. Ditko could have been like Lee, appearing on the convention circuit, lending his name to television shows, getting cameos in movies, and otherwise making bank and becoming a household name. Instead, he believed his work spoke for itself, and kept creating it whilst basically just living a quiet life doing what he loved--making comics and sharing his views. Ditko lived life on his terms and no one else's--a totally Objectivist thing to do. Regardless of if other creators, fans, or anyone else agreed with that, I sure respected it--and now offer my respects in a whole different way as we all mourn Ditko's passing.